The kids are back in school Yay!! ​Fall is the perfect time to cozy up with a new craft project that is just for you. Craftsy has put ALL classes on sale! Over 1,000 classes available! Get better at what you love to do! ​Take a class at these savings while you can, do it at your pace through this online class platform while the kids are learning new stuff at school. You deserve it too! While you are busy getting the kids back to school and thinking about what you may be able to do this fall for yourself, consider Craftsy, they have up to 50% off supplies this Labour Day week. Sale starts August 31 and hurry it ends monday! Need some thread to get those quilting projects done this summer? I know we are all in summer and holiday mode but this is a great time to get what we are low on as the price is right! With online shopping it is so easy to enjoy our vacations and shop without effort. ​Wouldn't it be nice to come back from holiday with a colourful package of thread in the mail? I hope you are enjoying the sunshine and enjoy a safe and happy summer vacation! 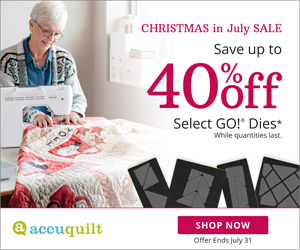 FYI if you are looking for a good quilting book, Connecting Threads has them on sale now, click on the image below to check out their website and the deals on some really good ones. ​'Nuff said another great deal at Craftsy! Get them before they are gone and have a wonderful weekend! 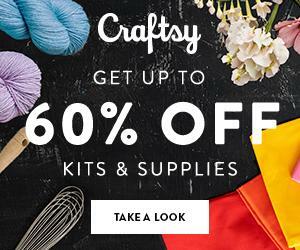 More than 50% Off Yearly Subscription to Craftsy Classes! Want to take great creative classes in your jammies? 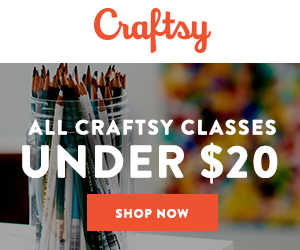 Yearly unlimited Craftsy classes were $18.99 US per month which is more than $227.00 US annually! This is now only $10.00 per month USD! If you have been thinking about getting unlimited access to amazing classes ( I have taken many and they are amazing!). I have learned so much from Craftsy.com instructors. Just Think about what you can learn and new projects to do! Now is the time. How to get this subscription at this price? Simply, click on the picture at the top of this page to inquire about this great deal!